This is the transcript of the conversation between Dr. Michael Congleton, MD, Ph. D, President of the South Pacific Region of the Sathya Sai Organisation, USA and Prof. G Venkataraman, eminent Physicist and former Vice Chancellor of Sri Sathya Sai University. Prof. Venkataraman (GV): I will begin by extending you a welcome to our Studio. I am going to start by asking you to introduce yourself. So, tell us about your profession, where you come from, etc. Michael Congleton (MC): My name is Mike Congleton, I am originally from Texas, and I got my initial education in physics, a Ph.D. in that subject. GV: Welcome to the club; I am also a physicist. MC: It’s a favourite subject of mine. I got a National Science Foundation Scholarship in physics, and completed my Ph.D. in plasma physics. I tried to get a job at the National Labs to do some things that I was interested in, but at that time, there seemed to be an abundance of physicists. GV: Which year or period was that? MC: In 1972. Failing to get a job, I applied for and was accepted to attend a large medical school. GV: You were not scared of studies all over? MC: No. I was interested in learning how things worked. GV: That’s all right. But you know, when you go to school you have to write exams. I was having nightmares about exams for many years! MC: It didn’t discourage me at all; I actually wanted to go to medical school! When I finished my under-graduate degree, I got a National Science Foundation Scholarship in Physics to continue on in physics. So it seemed like I really liked physics, and I just continued on and put off the medical training. But with not being able to get a job in a National Lab that I was so interested in, I applied to medical school and got accepted to the 5th largest Medical Center in the United States – a 1,200 bed Hospital. MC: Yes, University of Texas in Galveston. After I completed medical school, I got interested in surgery. But, then suddenly I had to try to treat some psychiatric patients who were surgical patients too, and I got very keen about psychiatry. So I specialized in psychiatry! I finished my residency in psychiatry and then wanted to continue on with some research. MC: In medicine, that might involve physics. I had done studies in microwave spectroscopy in plasma physics, and I thought by using a microwave resonant cavities and analysis sorts of methods, we could apply that to the study of nerves or neurological disorders. So, that was in the back of my mind. I talked with the Navy and they were interested, and offered me a commission, which I accepted, as the Commander in the Navy Medical Corps. GV: Did you sail or were you on ground always? MC: Well, I was stationed in a laboratory; it was a Naval Health Research Center, but I did travel a lot. MC: I was on ships, doing studies, and more research. GV: Did you do research on ships? MC: Well, I researched, for instance, to establish the effects of long working hours on fatigue, performance and those sorts of things, and trying to enhance the working environment so that people could do better jobs, and not to be too over-taxed. But while I was finishing my psychiatry residency, Carol, my wife and I got interested in Yoga. MC: It was around ’78. GV: Any particular reason why you got interested in Yoga? MC: Yes, while we had been taking some Yoga courses, Carol was keen on Yoga and I went along with her, and read some books on this. GV: Did it have anything to do with your interest in psychiatry? MC: Yes, I used to read books on psychiatry and there was one Yogi named Swami Rama, who had written a book ‘Yoga in Psychotherapy.’ He is from the Himalayas and wrote several other books one of which was ‘Living with the Himalayan Masters’. I had the good fortune of meeting Swami Rama and he had established an Institute back in Honesdale, Pennsylvania called the ‘Himalayan Institute’. So, being interested in this, we would go to Houston which was right up the road from Galveston on the weekends and buy books on Yoga, Chinese philosophy, etc. GV: He was one of the customers in the book store? MC: Yes, he was a customer in the book store, apparently and said, “You need to buy a book about Sai Baba.” So I went over to that part of the book store where it had books about Swami. And I looked, and it was on the very top shelf. I was a chief resident in psychiatry, so can you guess what book I was attracted to? MC: That’s right! I picked up ‘Sai Baba: The Holy Man and the Psychiatrist’. GV: No prizes for guessing that, because, most doctors come to Swami via Sandweiss. He should get a commission, I suppose! MC: Yes! He should be getting a payback on that! I picked the book off the shelf, and I saw a picture of Swami – a good-looking, handsome Swami, and I thought He looked very Western to me! So I went through the books and looked at the ones that I was least interested in, and when I came to Swami’s book – Sandweiss’ ‘The Holy Man and the Psychiatrist’ – I thought, “Well, I don’t really need this book.” So I put it up on the top shelf and turned around, and then, the book just flew off the shelf and hit me on the head! And Carol said, “You better buy that book!” So we bought the book and as fate would have it, and Swami would wish it, I ended up in San Diego working at the Naval Health Research Center, right around the corner from Sam Sandweiss’ home. GV: When did you meet him first? MC: I met him first when I was working at the Navy, doing this research and traveling back and forth to Washington. GV: You knew he was there, I suppose? GV: You didn’t know that? MC: No. But we were interested in going to India, because of our interest in Yoga, and I wanted to go to Rishikesh, or up to the Northern part of India where the Yogis live. We also brought, ‘Autobiography of a Yogi.’ And it just stimulated our interest even more. We had our home still in Galveston and a hurricane came through in there and damaged the home. There was five feet of water in the house. After we had it repaired with the insurance money, there was enough money left over to take a trip to India! GV: You mean, you used him as your tour guide! MC: That’s exactly right! So I got there, and he couldn’t be more helpful! He told us how to go to see Swami. And in fact, that night, I think it was Elsie Cowan at his home as the guest speaker. Hearing her story (of the resurrection of Walter Cowan, her husband, by Baba) was also very interesting to me; she was there as Walter had already passed on. In any case, going and seeing Swami was the last and the greatest part of our trip to India. 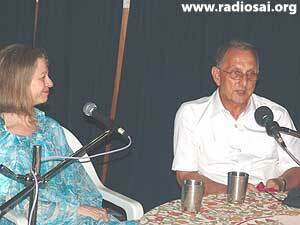 GV: Surely, you must have discussed Swami with Sandweiss? MC: A little bit, yes. GV: You wanted to find out yourself, directly? GV: Was that in the early eighties? GV: So you saw Swami first in 1984? GV: Where was that? Here (in Prasanthi) or Bangalore? MC: It was here. After visiting Kathmandu when we got to Kolkata, we discovered that India had been on a general strike for the last four weeks while we were traveling around in Nepal. And Andhra Pradesh was the State that had instituted the strike; the Governor of Andhra Pradesh had been ousted from the Parliament and everyone was upset about it. And so the ashram had been closed for four weeks when we got to Kolkata. But we were desperate to come and see Swami. The attraction was so strong and we just felt like crying because it didn’t look like it was going to happen. Suddenly, we were able to catch a plane to Bangalore and got into the Hotel there. When we checked in and we were told all buses had stopped running to Puttaparthi for one month! There was no chance to get there! We put our clothes in our room, came down and talked to the concierge. She said, “I just heard the buses had started running to Puttaparthi.” So we rented a car and went over to the bus station, and sure enough they were running! But, there were thousands of people wanting to get on the buses, as they had been closed for four weeks. But like I said, the strike had just ended. So when we got to the road-blocks, our driver would stop, and I would get out, run around, pull the rocks out of the way, and then, villagers would come out, wave at us and smile, and we just carried on and finally reached Puttaparthi. I think we were the first people around after it had been closed for a month, and we were thrilled to be here. So we checked in and went into a shed; I think there were four other couples in the shed. Of course, Carol’s idea of camping out is staying in a four star hotel! So you can imagine us going into a shed and I thought, ‘What are we going to do?’ So we went outside to a tailor, had some clothes made, got a mattress, and came back in, got comfortable and settled in. GV: You really roughed it out! MC: Well, yes, I guess we did, in a way. It was a new experience. GV: Were you mentally prepared for all that? MC: I was probably prepared for it, but I don’t think Carol was prepared for it. But my goal was to see Swami. GV: So, when did you see Him? In Darshan, the next day? 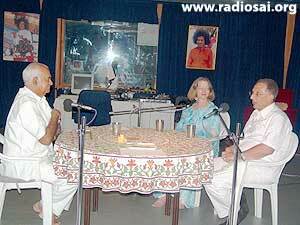 MC: Yes, the next morning we saw Swami in Darshan. There must have been maybe 30 or 40 people in all. MC: Yes, it had been closed for a month. GV: So, you must have got to see Him almost at point-blank range? GV: So, how was it? MC: You know, my son John was 11 years old at that time. We never talked about Swami. We just saw Swami and you know what his comment was? GV: Is that right? At first look? MC: First look! He just knew! In the innocence of childhood, he just knew! And I was so impressed with that. 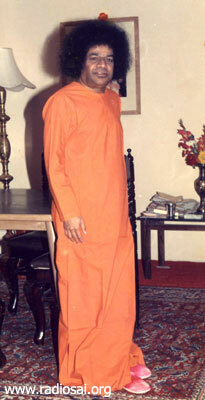 Swami just seemed to glide across the ground and He seemed to be transparent. You just see Swami through the buildings and everything; it was a mystical experience. We had to get back to work, so after the Darshan, we headed back to the Hotel. But on the way, the driver said, “I know of a place. There’s a devotee, he has a little orphanage. 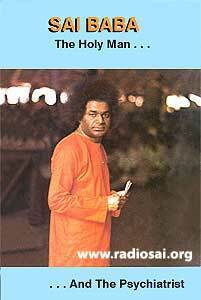 Swami gave him a couple of medallions and they are miraculously producing amrita (nectar)! GV: Oh! That’s near Mysore ! MC: Yes. It was on the way back; I guess it wasn’t too far out of the way. So I said, “Sure! Let’s go there!” And at that time, this little man – his name is Halagappa? GV: Yes, I think his name is Halagappa. MC: This is back in 1984 and he had a small metal building. GV: Yes, next to the Kaveri River. MC: There’s a temple in it and all the pictures that had Swami in it were covered with vibhuti! GV: Yes! I have been there. MC: And he showed us these little medallions, one of them was Shirdi Baba and the other was of Sathya Sai Baba. It is a copper-clad, kind of enameled picture of Swami – Sathya Sai and Shirdi Sai – and they were exuding this liquid! And I am a physicist by training, dealing with pure science. And in my book, my basic approach to life was - if I couldn’t replicate it in a laboratory, then don’t talk to me about it. I don’t want to know any mystical stuff. If people believe in telepathy, they need to see somebody about it! But I saw these medals flowing with this amrita and I just started timing how fast the liquid was forming. He put it in my palm and I could see that the liquid was flowing down into the center of my palm about 1 drop every 10 or 15 seconds! It was amazing to me! No tubes attached. It was just coming out of nowhere! It was like energy being transferred to matter! GV: You want to hear my first experience of a miracle? GV: It’s very interesting. 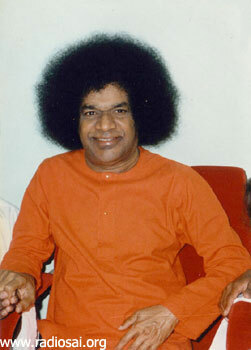 I had heard of Sai Baba long time ago, and in fact, I had seen Him when He came in Bombay in 1968. But the time was not right for me to come into His fold in full measure. I had to go through a couple of rather nasty jolts, including a rather traumatic experience. And then, I came. But I did not realize that He was an Incarnation of Divinity. So I said, ‘Yes, He is a good man, a holy man, a saint; but I don’t buy the miracles!’ And I had this argument with my uncle in Bangalore, and he said, “Oh! Don’t think too much of yourself. There are scientists much bigger than you, more famous than you who have acknowledged!” I said, “Look, it’s against all laws that I know, and these laws have been established by great people like Einstein.” I did a lot of name dropping, shall I say. He was not impressed with me! So I couldn’t convince him. I just took it politely; didn’t say anything. I gave my talk and it was time to go. I wasn’t sure how I was going to return to Hyderabad, because the whole country was in turmoil. So he said, “Come with me, I will take you for Darshan.” And we went to the next building, the Trayee Brindavan (Swami’s residence). He took us inside, and then Swami talked to me and was discussing how I would return and things like that. And finally He told Prof. Sampat, “You put him in your car and have him dropped at the airport.” In those days, the roads were empty; you could easily travel. It was a lonely road – not yet stricken by trouble. I went there and gave my mother a bit of the Vibhuti and told my uncle all about this, and he gave me a rather mean look! He said, “You were the guy who denied all these things! I will talk to you later!” And that was it! Of course, since then I have seen a lot of those – not the real spectacular ones like He did in the fifties; between the forties and the fifties, there were really amazing things! But, I have had more than my shares of miracles. And then, I realized after studying a lot of Vedanta, that He has the power to directly convert consciousness energy into matter, whereas, physical energy which we normally convert into matter through the E=MC 2 is a lower form of consciousness energy. And even the Big Bang originated with a sort of derivative of Pure Consciousness and since He is Pure Consciousness Embodied, He can directly convert that into matter. That’s how I rationalized it but that came much later. But it was a huge 10,000 volt shock to see that thing, first time! MC: Oh, I can imagine; it was the same affect with me! 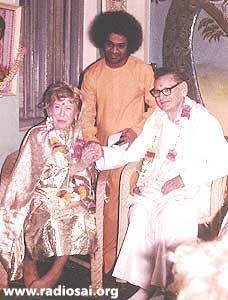 MC: But we made it back to San Diego and I went back to work and started going to the San Diego Center with Dr. Sandweiss and reading more about Swami. GV: Did it make any change in your life in any way? MC: Oh yes! I started thinking that there is more to life than material pursuits. And that the spiritual element of our life was very important – which I pretty much neglected. Although I have always been a strong believer in God, I was mainly focused on intellectual pursuits, up until that point. GV: Pardon me for interrupting; did you look at Yoga merely as a physical exercise or as something to calm the mind? MC: Oh, initially it was the physical asanas, the Hatha Yoga. But as I studied it more, I discovered that there was something called Raja Yoga which covered a lot more than just the asanas. Of course, I was studying that in the Yoga for many years. I was trying to understand it and it had led me to other pursuits too in trying to see how the spiritual exists within us. 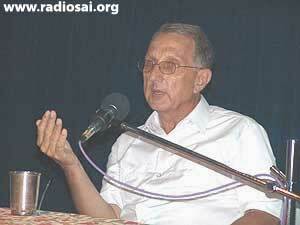 GV: At any point, did you come into contact with Bhagavad Gita? GV: Was that before you came to Swami or after? MC: After we came to Swami. I also discovered that Einstein had a copy of the Bhagavad Gita too. MC: Yes, and he read it. 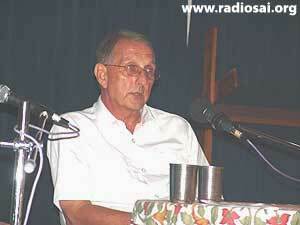 GV: Do you know that Copenhagen read it in original Sanskrit; he took Sanskrit lessons in Berkeley ! MC: I don’t know how anybody can read Sanskrit; I tried to learn ist myself, but it would be a miraculous experience if Swami could make me understand it. But, I went back to work and I started going to the Sai Centers and as fate would have it, the State Department asked me if I could go to Bombay (now Mumbai), India, and see if there was a way that there could be some medical technology transfer between the two countries, and I gladly accepted the task and went to Bombay. GV: We are now into ’85 -‘86? MC: Well, ’87. So I went to Bombay and worked with the Municipal Corporation and interfaced with the Hospitals there; I am trying to remember their names - King Edward Memorial Hospital and others there. MC: Yes. I finished my meetings and the studies. I needed to write a report for the State Department and in the back of my mind, I thought: ‘I am taking two weeks vacation; I am going to see Swami.’ So at the end of the two weeks I came down to Bangalore, and they said, “Swami was in Kodaikanal, and He would be coming back to Whitefield in two days.” So I found a place that was local to Whitefield, right across from the main gate and waited. 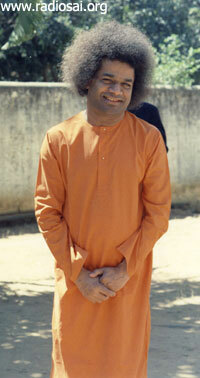 When Swami returned, it was a small group of devotees – only 50 with Him. I thought it was a large crowd; but it’s nothing like today! There was a Darshan tree, and we formed lines. GV: Yes, I remember, the Sai Ram shed. MC: Even if you were the last in line to go, you had a great seat anyway! And Swami came around and I felt like I was being totally ignored! And I noticed people had notes that they were writing and giving Swami. We saw a presentation where someone from Africa read poetry that he had written. So I thought: ‘I will write a little poem, and I will ask Swami for an interview.’ So, He came out, walked around, took my request – the little letter – and said, “Go!” So I went into the compound and had my first interview with Swami in 1987. Then He walked right over to me and I was sitting more towards the front, right across from a couple of twins – Indian ladies – and He swept His hand through the air once, and right in front of me He fanned out 10,000 U.S dollars in 1,000 dollar bills and held them real close to my face! I was looking at them; they were used notes! I had never seen them in that denomination and I couldn’t imagine that somebody was actually using them! GV: Isn’t that an amazing way of putting that in some kind of a demo! MC: Yes! He looked at the ladies sitting right across from me and they didn’t say a word; He shook His head back and forth and said, “Five minutes of pleasure and 23 hours fifty-five minutes of pain and suffering!’ And again, He swept His hand through the air, and materialized a rosary – a japamala! He held the mala at the very top and it looped down under His two hands. He pulled a little bit at the top of the mala, and it split into two malas! It was like peeling a banana. He was splitting it apart, one mala was going up, and two malas were coming out – and click, click, click – then there were two identical malas; one for each twin! GV: Where were those twins from? MC: I am not sure. MC: Yes, they were Indian ladies. He also materialized a watch for one of the students there, and I learnt the significance of watch later – W-A-T-C-H meaning, Watch your Words, Actions, Thoughts, Character and Heart.